The building is deteriorating steadily and losing tenants, who wonder why the owner doesn't either maintain it or sell it. 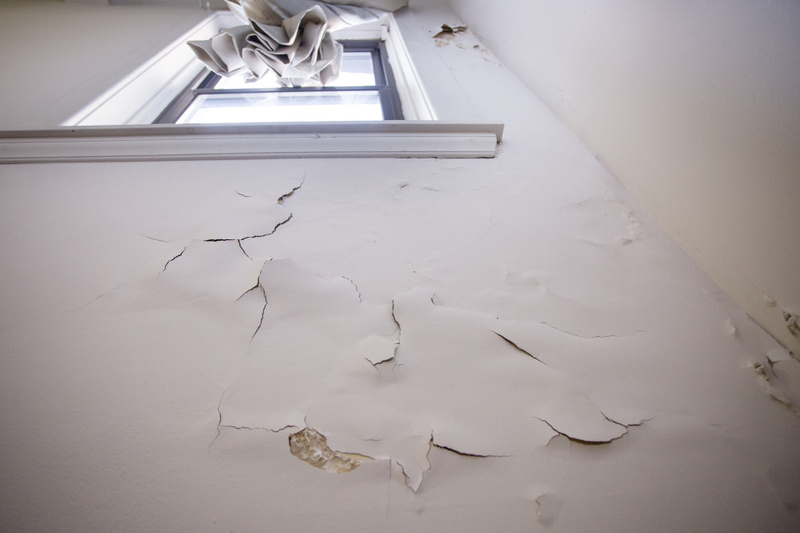 Tenants in Portland’s landmark Time & Temperature Building have complained about ongoing neglect, such as peeling paint and crumbling plasterboard, pictured this week. A historic office building that defines downtown Portland’s skyline is in the midst of an exodus of tenants as the property continues to fall into disrepair. Elevators inside the Time & Temperature Building at 477 Congress St. are constantly breaking down, tenants say, and the elevators’ inspection certificates expired in February. Paint is peeling off the walls and ceilings. Corroded metal beams in the parking garage drip rusty, oily water onto parked cars when it rains. The tenants say much of the building was without heat last winter, and office temperatures over the summer rose as high as 90 degrees because the air-conditioning wasn’t working properly. They said the property’s management has been unresponsive, and building security after hours is nonexistent. Several longtime tenants said they are fed up and are thinking about vacating. Others have already left. 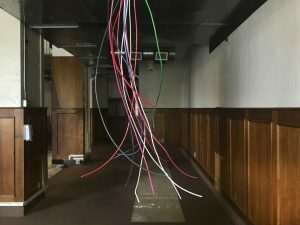 Depke, president of Portland-based internet marketing firm Spire Express, said he has lost clients because of the building’s shabby condition and lack of security. He also is concerned about his computer equipment because water from the HVAC system has been leaking into offices and computer closets. 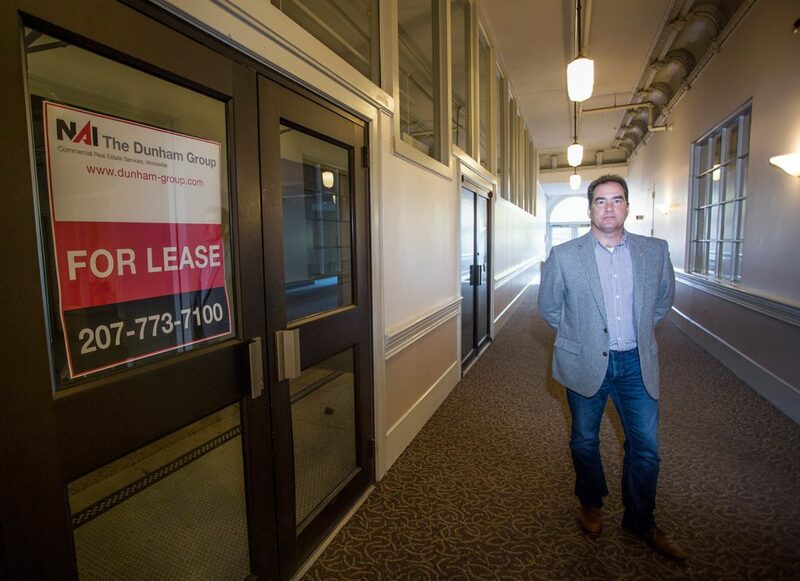 Bowen Depke, president of SPIRE Express, a marketing company located on the fifth floor, says that vacant storefronts hurt business for his company and the others in the building. “The owners and the management are running people out of the building,” he said. Occupants said it’s clear that the property owner no longer cares about the building’s condition or keeping them as tenants. What’s even more confusing is that local real estate investors have inquired about buying the building and repairing it, but they can’t get the building’s asset manager to respond. 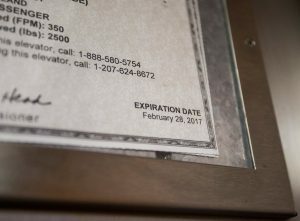 The Time & Temperature Building’s elevator inspection certificates are expired. “You leave a message and nobody calls you back,” said Sheldon Ashby, a Portland real estate investor who owns nearby buildings at 480 and 415 Congress St.
CWCapital Asset Management of Bethesda, Maryland, which initiated foreclosure proceedings against the building’s former owner, did not respond to an email requesting comment. The 14-story office tower, which opened in 1924 as the 12-story Chapman Building, can be recognized from miles around by the 30-foot-wide, 9-foot-high digital clock on its roof, a Portland landmark since it was installed in 1964. In its early days, the Time & Temperature Building was distinguished by a large, two-story rectangle carved out inside an extension of the building that was lined on the ground floor with upscale shops. Above, a glassed-in mezzanine and balconies looked down on a sloping floor, which was illuminated by a massive skylight. The building also housed Maine’s first arcade. Common in Europe and prominent in large American cities, including Providence and Cleveland, the arcade revolutionized shopping. The Chapman Building became a prototype for the modern shopping mall in Maine, but the arcade’s original architecture has since been sealed away under false ceilings and drywall. Despite the building’s worsening condition, it is still home to more than 100 businesses. Owners of those businesses say it’s getting harder and harder to justify staying there. Paint is peeling under a window on the second floor of the Time & Temperature Building in downtown Portland. Ashby, owner and designated broker of Ashby Real Estate, said he has tried several times to make an offer on the property, which he would like to renovate and bring up to “class A” office standards. “I’m still waiting for a call back,” he said. Current and former tenants said they’d like to know what the deal is. Don’t the building’s owners want it to succeed as a business? And if they don’t want to take care of it anymore, why don’t they just sell it? “If it could be restored … Portland would eat that place up,” said Scott Whytock, a former Time & Temperature tenant of six years who said he got fed up in August and relocated his business to Pearl Street. When WMTW-TV had its station in the Time & Temperature Building from 2000-2014, the woodwork was covered by heavy black curtains to create the studio, so a lot of the wood was protected from wear. But last May there was exposed wiring. 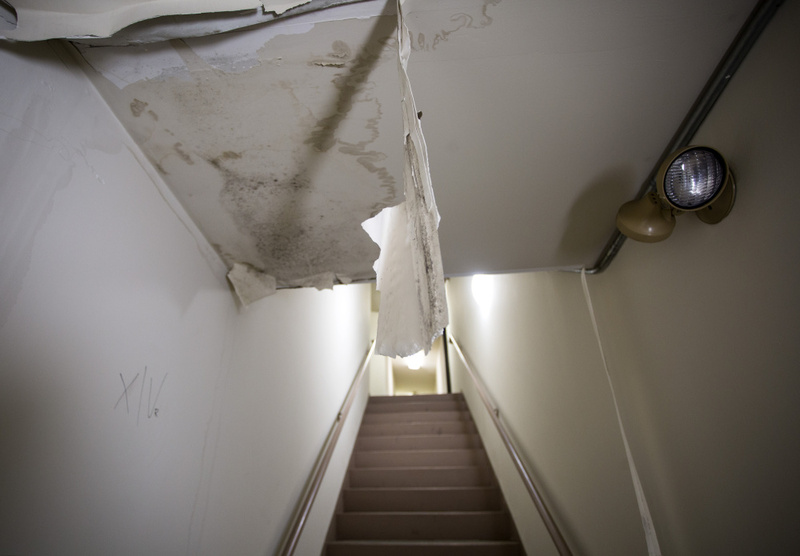 Whytock, owner of August Wealth Management, said he moved out because of the continued deterioration of the building, and because the property manager didn’t seem to have any interest in taking care of it. The 93-year-old building’s recent history is complicated, starting with a foreclosure in May 2016 that placed the property in the hands of a Maryland-based “special servicer.” Special servicers are responsible for recovering assets on behalf of bondholders who purchased commercial mortgage-backed securities. The building’s previous owner, a subsidiary of New York City-based Kalmon Dolgin Affiliates LLC, had been negotiating with the special servicer, CWCapital Asset Management of Bethesda, to reduce the loan’s $12 million principal. Those negotiations broke down in April 2016, and CWCapital initiated foreclosure. CWCapital set up a limited liability company called 477-481 Congress Street Holdings LLC and granted it the right to collect leases and rents. CWCapital did not respond to emailed questions for this story. According to notes made by CWCapital, the loan was referred to special servicing in February 2015. However, the reason wasn’t lack of payment, according to servicer records provided to the Portland Press Herald by research analyst Sean Barrie of New York-based Trepp LLC. The problem was a lack of tenants. At a time when the average occupancy rate for office buildings in Portland was 90 percent, the Time & Temperature Building’s occupancy had fallen to just 60 percent. Tenants say it’s now closer to 50 percent, with more tenants leaving every month. Companies such as Trepp follow the repayment progress and prospects of loans that have been pooled together and sold in pieces, or tranches, to investors in commercial mortgage-backed securities. Information about the health of each loan is used in determining the investment grade of the securities. 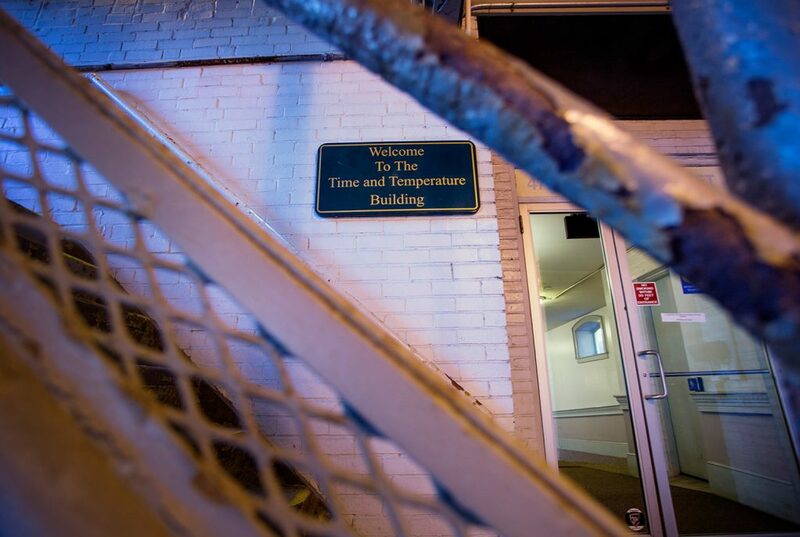 The Time & Temperature Building’s remaining tenants are unhappy with the upkeep of the building, such as the stairwell in the parking garage, which has rusting metal and peeling paint. Commercial mortgage loans can go into default for reasons other than lack of payment, including failure to maintain a contractually specified occupancy rate or loan-to-value ratio. The entire remaining principal of Kalmon Dolgin’s mortgage loan, totaling about $11.3 million, was scheduled to be due in a single balloon payment to the investors in December 2016. With Kalmon Dolgin telling the servicer it could not make future payments or attract new tenants, CWCapital decided to foreclose. Depke said some tenants have theorized that the building now can’t be sold until further negotiations are concluded between CWCapital and the bondholders who bought the mortgage-backed securities. The bondholders will have to agree to take a significant loss, because the property is likely worth considerably less today than it was when Kalmon Dolgin bought it for $12 million. City tax records assess the property at $5.3 million. “This is typical for these types of securitized deals, as the negotiation process between bondholders and the bond issuer often goes on for years, especially when there is a substantial write-down,” Depke said. In the meantime, the historic property is in a sort of investment limbo. Nobody involved wants to spend more money on fixing it, and yet they’re not willing to sell.